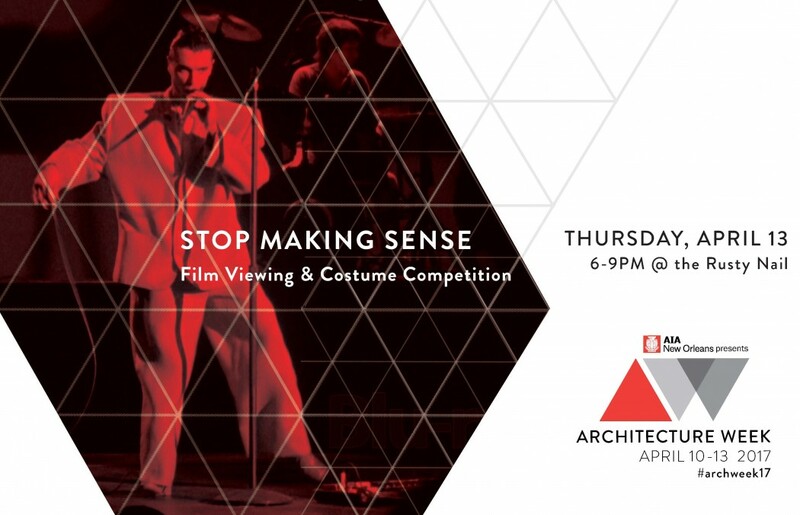 Join us for the Architecture Week New Orleans closing event at the Rusty Nail’s outdoor patio with a screening of the 1984 concert film Stop Making Sense by the Talking Heads. The band has long been affiliated with the art and architecture communities; three founding members graduated from the Rhode Island School of Design, and a fourth member attended Harvard for Architecture. Praised by Leonard Maltin as ‘one of the greatest rock movies ever made’ Stop Making Sense filmed live performance of the Talking Heads over three shows at the Pantages Theater in Los Angeles. Attendees are encouraged to wear their best ‘Big Suit’ for a dance and costume competition held midway through the film. A panel will judge the competition and award prizes. First place prize for the big suit costume & dance competition is $100 giftcard! This event is part of a larger series of program for Architecture Week New Orleans, April 10 – 14, 2017. Registration is free for this event, and partial proceeds will benefit our nonprofit affiliate groups and Make Music Nola.